White Bear Lake, MN – Boat ramps across Minnesota are busier than ever as boaters and anglers venture out to enjoy Minnesota lakes and rivers. At landings across the state, access ramps are getting a much needed upgrade to include CD3 Watercraft Cleaning Stations that are designed to halt the spread of Aquatic Invasive Species (AIS). Stations have recorded over 10,000 uses since being installed last fall. Boaters are encouraged to take advantage of the free tools available 24 hours a day. Wildlife Forever’s Clean Drain Dry Initiative, in partnership with CD3 developers, has been leading a coalition of state and federal agencies, non-profits, universities and lake associations, to implement and design cutting-edge technology that monitors use of the waterless system and sends alerts on maintenance and use. 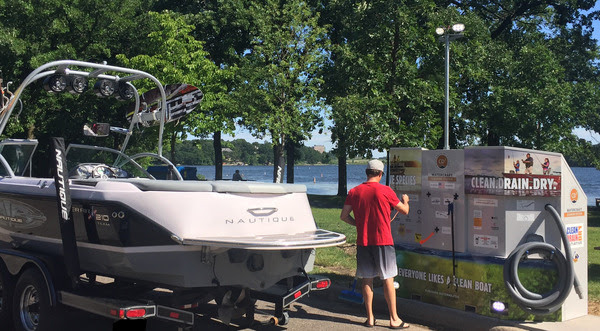 Designed for day boater use, stations are free and user-operated that include a wet/dry vacuum, blower and tethered hand tools, to help make sure boaters and anglers are not ruining the waters they enjoy. New advances in digital outreach technology will also allow stations to feature a Wi-Fi or Bluetooth connection for enhanced invasive species education and reporting. Mapping tools will also show the location of decontamination sites for boats and equipment moored or docked for three days or more. Open for use every day and hour of the boating season, CD3 Stations enhance accessibility to public waters by reinforcing Clean Drain Dry stewardship and conservation practices needed to slow the spread of AIS. “Partnerships are the key to tackling this issue. It is also our responsibility as stewards and resource managers to use and implement the available tools that slow the spread, protecting fish, wildlife and our recreational economy,” said Pat Conzemius, Executive Vice President of Wildlife Forever. Contact Wildlife Forever or your local natural resource authority for more information about CD3 Watercraft Cleaning Stations and tools for protecting your lakes and streams. The Clean Drain Dry Initiative™ is the national campaign to educate outdoor recreational users on how to prevent the spread of invasive species. Strategic communications, marketing, outreach and educational services provide access to consistent messaging, and resources for implementing AIS prevention programs.